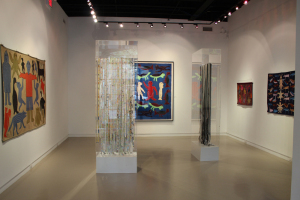 Feheley Fine Arts and Pierre-François Ouellette art contemporain are delighted to unveil their first collaborative exhibition at Centre Space. Intertwined features Inuit textiles juxtaposed with works referencing textiles by Jérôme Fortin. The creation of textile works of art is a modern adaptation of the traditional practice of creating intricate patterns in skin clothing. This form of graphic expression, also found in incised lines on utilitarian objects, established a rich image history. The introduction of southern materials, including duffel, felt and embroidery floss, allowed this rich tradition to find new life in contemporary wall hangings. 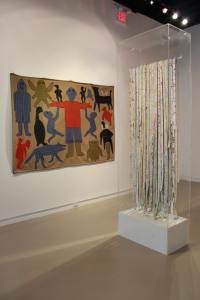 The works of Irene Tiktaalaaq Avaalaaqiaq, Elizabeth Angrnagangrniq, Winnie Tatya, Naomi Ityi included in this exhibition are all unique, yet they present a cohesive statement about the beauty and power of Inuit contemporary textiles. Jérôme Fortin returned to Japanese culture for inspiration in the series titled Self-portraits that he is presenting as part of Intertwined at Centre Space. 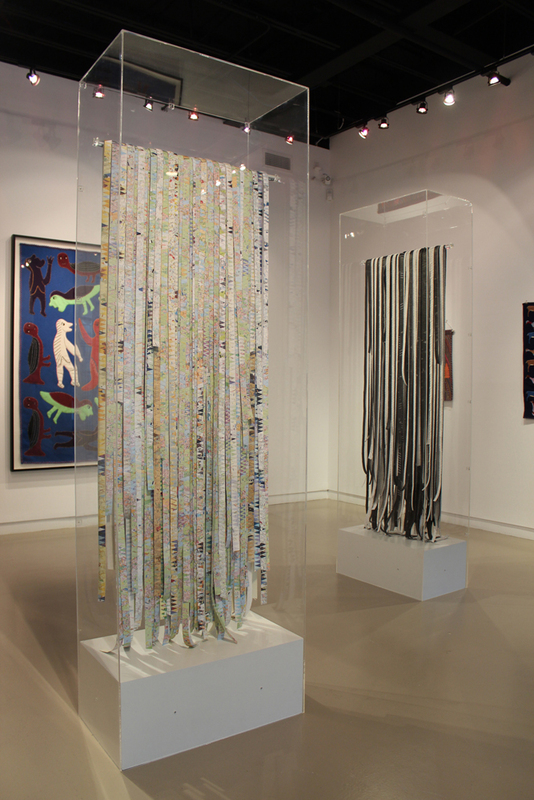 The work was produced in 2008 as part of an artist residency at Tokyo Wonder Site, a centre for contemporary art production, research, presentation, and exchange.Fortin created his Self-portraits from paper-based objects he found and collected while strolling through the streets of Tokyo, from the maps that helped him discover the world and from blank musical staves full of unheard potential. The series is primarily inspired by the traditional practice and healing ritual of Senbazuru, or Thousand Origami Cranes. The works are suggestive of kimonos, of the fabric they are made from, and of their mode of presentation in shop window displays and museums. 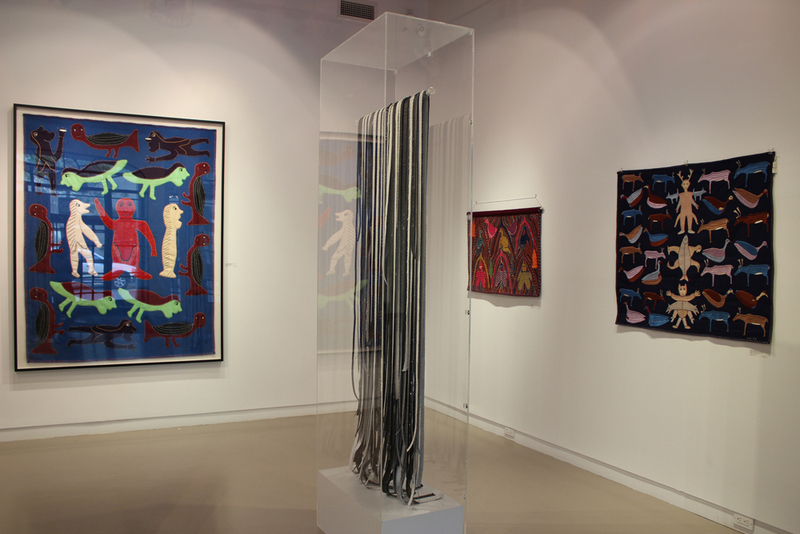 The two Self-portraits exhibited at Centre Space were shown in Shanghai, Tokyo and recently in Montreal at the Quebecor Gallery Museum (May 2014). 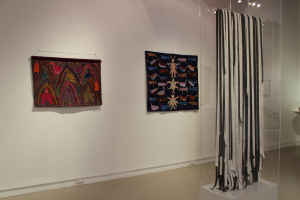 Another work from the series is currently travelling in Dreamland: Textiles and the Canadian Landscape organized by the Textile Museum of Canada and shown at Museum London last Winter. Of note, the onversation with Jérôme Fortin, Shaunna McCabe, Sarah Quinton, Pat Feheley and Pierre-François Ouellette that will take place Sunday 26 October at 11:00 am. Shaunna McCabe and Sarah Quinton are respectively the Executive Director and the Curatorial Director of the Textile Museum of Canada. 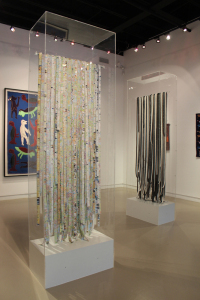 Recipient of the Pierre Ayot prize given by the City of Montréal in 2004, Fortin has had more than a dozen solo exhibitions including shows in Prague, Pretoria, Tokyo, Paris, Toronto and Montreal. His work has been presented in group exhibitions in Istanbul, Berlin, Bologna, Brussels, Paris, Cuba, Barcelona, Beijing and New York. Fortin has also actively participated in international artists’ residencies, notably at the World Financial Center Arts and Events (New York), la Fondation Christoph-Merian (Basel), Fonca (Mexico D.F. ), la Cité internationale des arts (Paris), the Ludwig Foundation of Cuba (Havana) and Tokyo Wonder Site (Tokyo). The Musée d’art contemporain de Montréal presented a major solo exhibition of his work in 2007 and in 2008 he participated in the first Biennale de Montréal. His works can be found in several public collections including those of the Musée d’art contemporain de Montréal, the Musée national des beaux-arts du Quebec, the Musée de Joliette, the Pretoria Art Museum, the National Museum of China, the Bibliothèque et archives nationales du Québec, the Canada Council Art Bank, the City of Montreal, and in several major corporate and private collections worldwide. He was a guest artist of the atelier of Antoni Tapies at the invitation of Toni Tapies Gallery where he produced the suite of prints entitled Barcelona and has been commissioned a number of public art projects in recent years.